The whole question raises some more immediate issues that could lead to a breakaway party from Labour. If Corbyn implements a full “deselection” process, then given the radical change in the membership of the Labour Party since Corbyn’s election, many moderate MPs may have little chance of being chosen to stand in 2020. This is increasingly likely as 2020 approaches as new members continue to join, and moderate members opt to leave. Any MP likely to lose their seat, already at odds with the current leadership, will have little incentive to heed Corbyn’s calls for party unity. It’s arguable that instead of unity, the reverse could be more likely and deselection could cause the Labour Party to split. Logically, moderate MPs denied the chance of retaining their seat in 2020, should have no interest in continuing to prop up (however lukewarmly) a leader with which they so fundamentally disagree. It would be in their interest to create a new party and provide themselves with the opportunity to stand in 2020. If moderate MPs realise that they cannot stand as a Labour candidate in 2020, then there is little to lose by leaving and forming a new party. The gains are all the greater when you consider that the circumstances are as conducive to creating a new party as they are ever likely to be. Labour continue to perform ever more poorly in the polls, but also Corbyn is an unusual party leader in British politics because there is such a disconnect between himself and his parliamentary party. As discussed in the past few months, this could be exploited by a new group of moderate Labour MPs (the core being the deselected MPs), that could attract sufficient support to be designated as the official opposition by the Speaker, with the leader becoming the Leader of the Opposition. This would deny Corbyn would the oxygen of publicity that he currently enjoys, as the new moderate grouping would be part of the warp and weave of daily politics (i.e. membership of parliamentary committees, frequent media appearances on the usual outlets). All of this is a massive difference to the “gang of four” who left Labour to create the SDP in 1981, which despite including senior MPs and ex-cabinet ministers such as Roy Jenkins, never quite had this status. From this platform, a new party would have a reasonable chance at the next General Election of winning seats. There would be opportunities to work with other parties such as the Liberal Democrats, possibly including an electoral pact for their mutual benefit. Of course, all of this is risky, but if deselection means that existing Labour MPs cannot stand in 2020, having a chance of contesting and winning a seat is better than none at all. I may be underplaying the emotional attachment that MPs have to their Party, but if they have such a detachment from the membership and the leadership those emotional ties must inevitably be weakened. Fundamentally, deselection will require affected MPs to resolve a clash between their principled commitment to left-of-centre politics and their (often lifetime) membership of the Labour Party. 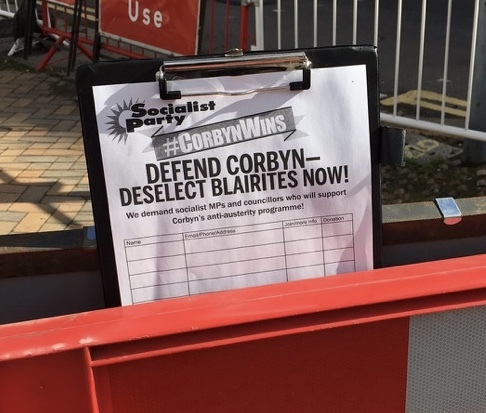 Corbyn will need to think extremely carefully about deselection because if he proceeds, he may discover that many MPs will ‘deselect’ them and the Labour Party is reduced to a mere protest group with a rump of MPs.